Ben is a favourite of Train2Game and studied with T2G for a number of years, taking part in game jams is a strong part of the wider community. It’s always great to speak with this young man who has a passion for games and is extremely well driven. Since finishing with Train2Game he’s gone on to a career in games and we caught up with him to hear how he’s getting on. Ben enjoyed Train2Game and it was a catalyst in his gaming career. He found he learnt on the course but experience in making games and having good mentors are essential to developing as a games maker and therefore a career in the games industry. Taking part in Train2Game Game Jams taught him about the development process. He’s gone on to mentor at Game Jams and be part of the judging process. Ben still regularly attends game jams and sees it as essential to becoming a better game developer. Ben now takes part in one game a month, a collective of games makers that share their projects in creating a title a month. Creating nice simple games and he encourages players to first make the first ever game: Pong. He sees it as a way to train yourself as a developer which highly recommends. Through the experience he’s learnt a great deal and made a huge variety of games. He’s not going to release any games as yet as he is still aware that he is growing as a developer. 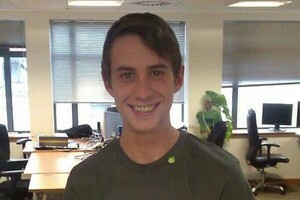 Ben works in the support team at Unity providing answers to any enquiry from any Unity user. He’s enjoying it a great deal, providing assistance by day and making games by night. He’s found that his skills as a rounded developer have continued to grow. This entry was posted in 2, Developer, game, games, Games Developer, job, Jobs, Student, train, train 2 game, Train2Game, www.train2game-news.co.uk and tagged 2, Ben Stoneman, developer, game, Games design, Games Developer, games industry, Student, train, Train2Game, Unity by Train2Game Blogger Team. Bookmark the permalink.